Ces Tan's real name is actually 'Rebecca', although no one ever really calls her that. She is currently studying at the UP College of Law, and there is nothing in the world she believes in more than the power of art and expression. She loves to dance and travel, and believes that David Bowie's music will live on forever. Chosen Ground 10: NOISE – Louder Than Ever Before! Ninja Academy: Unleash Your Inner Ninja at Manila’s First Parkour Facility! Vinta Bags: Classy and Colorful Bags for Every Girl for Any Occasion! Smitten Desserts: Fall in Love with These Sweet Treats – Fandom Desserts and More! 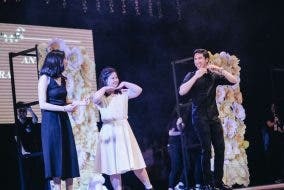 Ateneo Blue Repertory’s Spelling Bee: A-W-E-S-O-M-E Musical! 8 Reasons Why Sam Tsui and Kurt Schneider’s Concert in Manila Was Unforgettable!